The Works of Mercy provide the cornerstone for understanding Catholic teaching on social justice. They stand at the very heart of the Catholic Worker movement. This web page will attempt to list and define the Works of Mercy from a distinctly Catholic point of view, being identified in scripture as necessary for our salvation, drawing upon CW founder Peter Maurin’s Personalist philosophy in their implementation within the construct of the Catholic Worker movement itself. In the parable, the “Son of man” comes in glory with the heavenly host to judge men according to their works, separating them, just as a shepherd separates sheep from goats. Those who accomplished the above works of mercy (the sheep) sit on his right side and inherit the kingdom of heaven, because whenever they ministered to “the least of my brothers”, it was as though they ministered to Christ Himself. The others, the “goats” sit on His left side and inherit eternal damnation because they did not do the above works when they saw their neighbor in need. To the goats, his reply is “as you did not do it to one of the least of these, you did not do it to me (Mathew 25:45, ESV).” It is worth noting here that man is created in God’s image and likeness. It follows that we are capable of loving God only insofar as we are capable of loving our neighbor. James 2: 15-16 rebukes those who bless the needy without providing substantially for their needs. In addition, 2 Maccabees 7, 40-46 underscores the importance of prayer for the dead. Whereas the book of Maccabees is not included in the Protestant cannon of scripture, (it is included in the Roman Catholic and Eastern Orthodox cannons), the passage above provides proof that 2nd century Jews believed in the immortality of souls and prayed for their dead. 10: Keenan. S. J., James J., The Works of Mercy: Heart of Catholic Identity. The American Catholic, http://www.americancatholic.org/newsletters/CU/preview.aspx?id=237. Walker, David E., Works of Mercy. 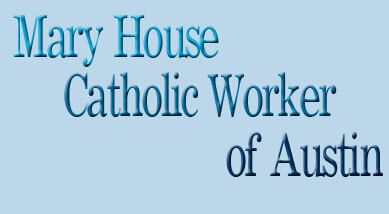 Mary House Catholic Worker, Inc., http://www.catholicworkeraustin.com/mercy.html.